ARLINGTON, Va. (April 26, 2007) -- Retired Air Force colonels Covert A. SoulË Jr. and Michael H. Wieland visited Washington, D.C., April 20 to meet with congressional representatives and senators from the state of Illinois. In addition to discussing pay raise issues for military members, the two, representatives of the Illinois Council of Chapters of the Military Officers Association of America, "stormed" Capitol Hill to discuss the Survivor Benefit Plan-Dependency and Indemnity Compensation offset. 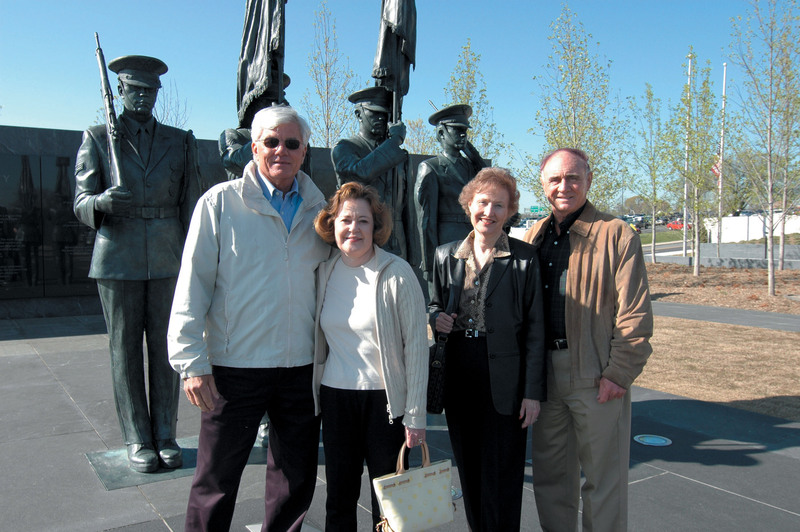 Retired Air Force Col. Michael H. Wieland and wife, Jane Wieland, along with Iris SoulË, and husband, retired Air Force Col. Covert A. SoulË Jr., visited the Air Force Memorial April 20 for the first time. The two retired officers, both members of the Illinois Council of Chapters of the Military Officers Association of America, were in Washington, D.C., to visit with congressional representatives and senators from Illinois to discuss military pay issues. The SBP-DIC issue involves two different payments to military spouses. The SBP is a special insurance purchased by retirees, voluntarily, to provide a portion of their retired pay to a surviving spouse. The DIC is special compensation to a surviving spouse whose sponsor died as a result of service in Armed Forces. Currently, if a surviving spouse is entitled to both an SBP and a DIC payment, the government docks the SBP payment, dollar-for-dollar, for the DIC. "What we were trying to do was get rid of the SBP-DIC offset," Colonel SoulË said. "Say I get a service disability and I pass away, they dock my wife's SBP dollar-for-dollar for the DIC -- which is not right. SBP is an insurance, DIC is a disability from service." While in Washington, the colonels visited the Air Force Memorial with their wives. The two were both donors to the Memorial project, and they were seeing it in person for the first time. "I think the Memorial is awesome," said Colonel Wieland, who is currently the president of the Illinois Council of Chapters, MOAA. "I've been taking pictures of it since I saw it. It really stands out on the skyline too, which is really neat. Everybody else has a memorial, so we should have one too." Both Colonel SoulË and Colonel Wieland were aircraft navigators during their military service, and both served time in Vietnam. Colonel SoulË flew aboard the O-2 Skymaster aircraft in Vietnam from 1968 to 1969. Colonel Wieland flew in the EC-47 aircraft over Vietnam, and in later years served at Andrews Air Force Base, Md., as part of the 89th Military Airlift Wing. While he never had the opportunity to fly aboard Air Force One, he did say he once flew with then Vice President Walter Mondale aboard Air Force Two during a trip to Panama.